In the long ago time of last weekend, Jose Mourinho responded to criticism that Chelsea are boring after their scoreless draw with Arsenal at the Emirates by saying that Arsenal going 10 years without a title is what’s actually boring. On Friday, Wenger was asked about this rebuttal. “The biggest thing for a manager is to respect other managers. 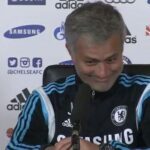 Some people have to improve on that,” said the man who shoved Mourinho on the touchline earlier this season. And since manager press conferences take place in the halls of a giant high school, reporters then asked Mourinho about what Wenger said. The Chelsea manager then did what Taylor Swift suggests: just shake it off. And now we know what Jose Mourinho sings in the shower.